sized community hill in Rumford, Maine. Black Mountain is better known for its world-class Nordic touring center which often holds national level meets. There is a very nice Alpine hill with an 1100 foot vertical drop and night skiing is offered. Additionally a tubing park is available which makes this quite a winter recreation find in Western Maine. Parking is nice and close to the lodge. If there is a big Nordic race that day, the reserve the upper lot for Alpine skiers! The lodge is a newer post and beam structure with a generous deck and is very nice! There is a nice walkway bridge over the Nordic trails to the alpine chair lifts. Black mountain has one of the nicest lodges in Maine. I give a grade of a A for parking access and a A for the day lodge. The Black Mountain alpine area is typically pretty quiet with no lift lines to speak of and plenty of room on the trails. The summit is served by a newer triple chair and the beginner terrain by an older double chair which is just right of a mountain of this size. They run a T-Bar occasionally too. I give a grade of an A for trail crowding and a B+ for lift infrastructure. Black Mountain has a nice gentle beginner area separated from the main slope offering 3 gentle trails back down. A nice low-pressure area to learn to ski but not a whole lot of variety. The intermediate terrain is where Black shines. They have blue and black squares labeled on the map, but most all fall into the intermediate category on larger mountains. It offers a nice step up for the beginners getting ready to move up to the next level. There are some great cruisers and winding narrow trails on the skiers right side of the mountain that skiers of all abilities would have a lot of fun on. 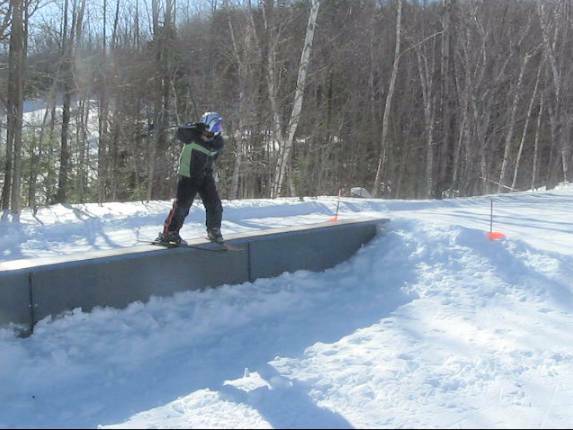 Black offers the terrain park some features and elements to play around on via the skiers right side of the mountain. A good place for newbies in terrain parks to get used to the features. My kids certainly had fun on the features but kids looking for bigger hits will probably want more. I give a grade of a B- to the terrain park. Interestingly, the steepest pitch on the mountain is right at the bottom of the hill. If there is a good snow cover, take a spin down 'Dead Cambridge'. A great trail name with a really nice short, but steep section to get some natural cover bump skiing in. We had a blast on this trail on a day with lots of snow. Otherwise expert skiers wanting steep groomers will be wanting more. I give a grade of an C to the expert terrain. @AlecPhoto checking out a new glade at Black. A volunteer group called the Angry Beavers have significantly developed the gladed terrain over the past couple of years. They have done an outstanding job! Check out my blog post about them here and video from a 2014 trip here. They have moved Black on the map for glades and have really opened up the mountain to a new demographic of skiers. If you are into trees I highly recommend it. I give the gladed terrain a B+. Check out their webpage for latest pricing, but Black is the best deal in Maine hands-down. I give a grade of an A+ for lift ticket pricing. 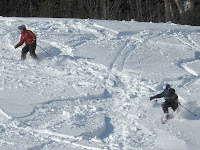 Black is a gem of a hill and is highly recommended for families that want to have a great day skiing. If you are an expert you will find their glades challenging and fun. You will have to keep an eye on the weather and trail reports as they are fairly dependent on natural snow cover but Black is a fun day skiing in Maine. Overall - I give Black Mountain of Maine a ranking of an A-. Check it out! Feel free to comment on what you think about Black Mountain of Maine below. Nice review Mike---Black looks interesting to me--perhaps I will pair with a trip back from Saddleback some wknd. A Black - Saddleback weekend would be a nice weekend! Black Mountain of Maine - Nordic friendly....not Family friendly. As first time season ticket holders, my family has been disappointed. It appears that their primary focus is on the Nordic events. Agree that the lodge is nice, but with nordic events scheduled every weekend, it is just too crowded. The primary area of the lodge is overrun with Nordic skiers. Sprawled out on the floor and with gear all over the place. And with no changing facilities, they often strip down to their underwear right out in the open. Alpine skiers are relegated to the small bar area on the second floor - not the best place for families with young children. Have seen bathroom lines 15 - 20 people deep as the nordic racers need to release their pre-race nerves. And btw, the air dryers in the rest rooms are meant for drying hands...not warming up your nordic boots. All in all, a disappointment for my family. Kids want to go back to Mt. Abrams....and we will. Took my 7 year old there this winter and it was a fantastic family experience - didn't notice a single Nordic skier with plenty of room for our gear and for lunch. I was really happy with BMOM and we are planning a lot of trips back for the 2016-2017 season. A fair critique - Nordic is there Bread and Butter. This may be exacerbated by the fact that Black was the only nordic center in Maine with snow for a while this year so a lot of races got moved there. Hopefully with some more snow on the ground it will spread out the nordic community a bit. Mike, Great report and assessment. BMOM is a great feeder mountain with a little bit for everyone. I learned to ski here as a kid and now am taking my kids here every weekend to ski. We love it and hope to see it survive for generations to come. The large Nordic events have been stream-lined to cause the least amount of disruption to the alpine skiers in the beautiful post and beam lodge. The copious amount of new cubbies added to the lodge in the 2012-2013 season has greatly helped organize the previous chaos. Trail widening on the Androscoggen has allowed alpine race events to be run without major disruption to recreational skier traffic. The Allagash is a destination trail for any novice/intermediate. Allagash is arguably one of the best new trails in New England in recent years. It still needs snowmaking added so conditions are dependant on natural snowfall. The gladed terrain has been slowly been openning up over the last 3 years with 100% volunteer effort. This year a new intermediate glade (Alley-Loop) has been added to the mix, about midway down the Allagash trail. The existing glades are getting thinned and widened to provide better flow. This brings the total to 7 glades with more in the works. Friday and Saturday night night skiing and tubing is a hoot and you'd swear that the lift is only being run for you and your family. Be sure to check out BMOM with mid-winter conditions as there is more than meets the eye. You can't beat the $15 day tickets anywhere in NE given the excellent grooming, amount of skiable vertical and variety of terrain. Yes, conditions can be hit or miss at times with limited snowmaking compared to the SR/SL areas but crowds are so low, that even in less than ideal conditions it's manageable. BMOM has a laid back vibe that is missing at bigger areas. Come out and support Black Mountain of Maine by giving them your business and help a Legend in Maine's ski community stay off the NELSAP list. Now that the MWSC has transferred ownership to the Black Mountain of Maine Non-profit board, the need to have a successful season has never been more critical. BMOM; Family/wallet friendly, and moving in the right direction. Thanks for the report. 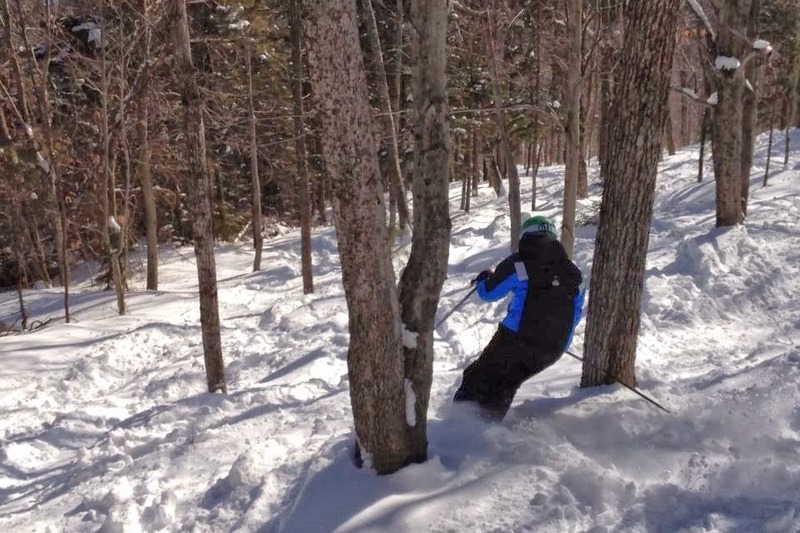 We had a great time skiing at Black in March 2013 and saw all the new glades. Here is our trip report. Unfortunately the snow conditions prevented us from getting in there but lots of good stuff is going on at Black. We are looking forward to getting back there again this winter.